Often, the best bike trails are too far from home for you to cycle all the way there and back again and still enjoy the scenery when you arrive. A rooftop bike rack is the obvious answer. Investing in one of these simple but ingenious devices allows you to take advantage of cycle routes further away. Also, if you’re going on a road trip, you can take your bikes with you for some fun away from home. Read on for our brief and honest reviews followed by a concise buying guide to make your life even easier. What Type of Bike Do You Really Want? Yakima makes rock-solid bike racks. This is their first ever entry into the fork style of rooftop racks and it’s a sterling effort. Working admirably with pretty much any bike you throw its way, you’ll run no risk of damaged paintwork while your bikes will remain rigidly in place throughout your journey. 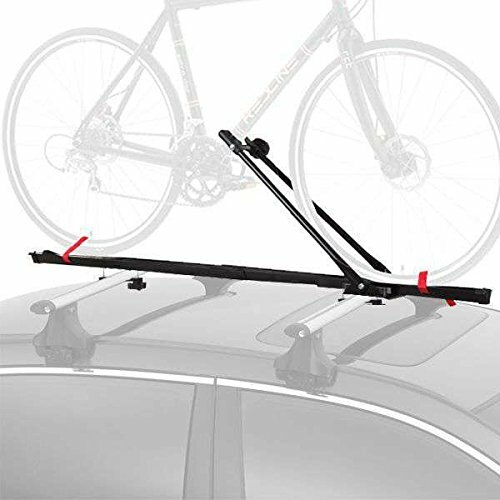 Yakima is a brand you can rely on for the best bike accessories and this fork rooftop rack can be fitted to the roof of your car with ease and slipped off with equally little fanfare. Positioning your bikes couldn’t be simpler and, since the rack doesn’t come into contact with the frame of your bike, there’s no concern about scratching up that precious carbon. Although the locking mechanism is easy to use, you will need to buy the locks separately. Since the price of the rack is so competitive, this could hardly be considered a deal-breaker. 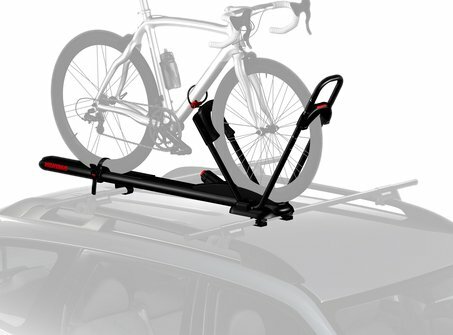 Thule is another heavy-hitter in the bike accessories space and this nifty upright piece of kit is a strong contender for the best rooftop bike rack up for grabs. The front wheel is secured to avoid contact with the frame of your bike using the nifty sidearm mount. Build quality is superb and the price is more than reasonable, too. 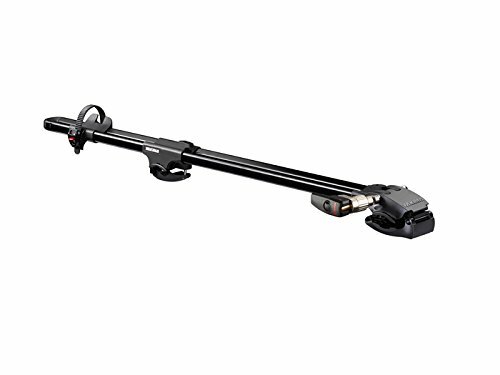 Thule produce top-tier bike accessories at a price you’ll love and this sidearm universal bike mount continues that tradition in fine style. Admirably weatherproof thanks to the aluminum tray, everything is rigid and built to go the distance. The front wheel is firmly secured using the side mount hook while the back wheel has a ratcheting strap to keep it safely tucked in. As with many of these rooftop racks, you’ll need to dig deeper for the lock – in this instance the lock is supplied but not the key! – and we have to say, the lock could be more secure. This minor gripe aside, the Thule Sidearm delivers in fine style. A slick and streamlined rack that looks great and performs just as well, RockyMounts JetLine is available in a range of colors to coordinate with your vehicle. For ease of use combined with security and value for money, this simple but effective rooftop bike rack deserves a place on any shortlist. If you’re a casual cyclist looking to take your bike out occasionally, the streamlined and brightly colored Rocky Mounts JetLine is the ideal rack for your needs. We say this because durability is suspect so for heavy, daily users, you’re better off looking for something more robust. Compatible with both standard brake systems and disc brakes, the JetLine holds most bikes with tires up to 2.7”. Installation is straightforward and this rack meshes well with a range of bars whether square bars or crossbars. A pioneering quick release locking system makes loading and offloading your bikes a cakewalk giving you more time on the trail and less time fussing around. Considering the competitive price and lifetime warranty, this is a no-nonsense rooftop rack perfect for occasional use. Next up is another fine rooftop rack from the stellar Yakima, the High Roller. This brand always places a premium on design but it’s never a case of form over function. The High Roller makes transporting your whole bike simple with no need to remove the front wheel. Compatible with square or round crossbars, installation is fuss-free. The first thing we’ll say is that you need to check for crossbar compatibility before steamrolling in and buying this rooftop rack on a whim. 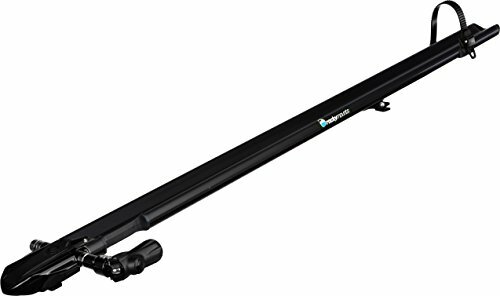 A wide range of non-Yakima bars will present a problem so it’s best to err on the side of safety and buy Yakima round crossbars or square crossbars according to your preference. The locking system is more than fit for purpose although, as with the bulk of rooftop racks, you’ll need to buy the lock separately. Despite alerting you to the drawbacks – and we’re always honest and frank in our product appraisals – this is a top-notch rooftop rack suitable for pretty much any size and style of bike. Working with all varieties of brake and suspension systems, you’ll have your bikes mounted and be on the road in minutes flat. 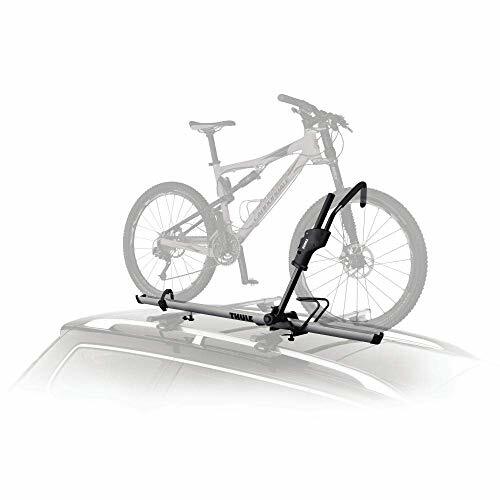 We try to provide something for all tastes and budgets with our reviews and for bargain hunters not prepared to compromise quality, this Cyclingdeal rooftop bike rack is a must. Despite the low cost, you’ll get an understated bike carrier finished in powder-steel that’s ideal for carrying the majority of bikes without needing to take off the front wheels. Materials are first-rate and, whatever your bike, it will fit neatly on the rack with the minimum of fuss. If you have an oversized bike, you might experience a little wobble so bear this in mind before committing to purchase. Just slide your bike onto the bike and strap it down and you’re good to go. The only real disappointment is a short warranty but you really can’t expect much more when the rack is this cheap. If you’re realistic about your expectations and you are operating on a tighter budget, this rooftop rack makes perfect sense. Last but by no means least, the Kuat Trio is a deceptively simple yet highly effective method of transporting your bikes the easy way. While this rack is certainly not cheap, in return you’ll get a piece of kit that might even outlast your car. Integrating seamlessly with a full range of bars, whether aftermarket or standard-issue, this is a flexible and efficient rooftop rack from a brand you can trust. Whether you’ve got a downhill racer or a Fat Bike, the Trio from Kuat is a pricey but outstanding rooftop rack that looks basic but performs to a very high standard. Although it’s not the cheapest rack, it’s certainly among the very best. You can tweak the 3 fork settings to ensure a nish fit whatever the shape and style of your bike. It works with 9mm, 15mm and 20mm forks. The rack slots effortlessly onto almost any type of bars regardless of brand which offers you far more flexibility than you’ll get with some Yakima racks. You’ll be able to lock both the frame and rear wheel with no additional cost for a lock or key as with many of these trickily marketed bike racks that demand you dig deeper for the essentials. For a reliable, stable and durable rooftop bike rack that should keep you going for years, investing in the Kuat Trio is a smart move. There are not too many things you need to think about when you’re looking for the best rooftop bike rack but there are several pointers that might simplify your buying decision. While the focus of today’s article is on rooftop bike racks, there are several other options at your disposal. We’re not here to give you the hard sell on any given product so it’s essential before anything else to ask yourself if a rooftop rack makes most sense for you. Arguably the most versatile bike rack and therefore the reason we reviewed exclusively this type of rack, this effective solution is not for everyone. 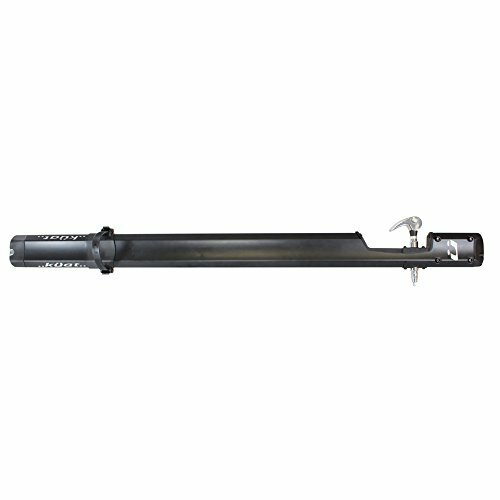 If you don’t have some kind of rails in place on your car, you’ll need to make provision for this. You’ll also need to check carefully for the weight your roof can support. Bear in mind, too, you’ll also need to be capable of lifting the bikes up and overhead. In all other respects, these racks make a solid choice. If you’re only planning to carry a couple bikes, you can get racks that you fasten to the back of your car using straps and hooks. Rubberized support arms and more straps keep your bikes in place. These are cheap, extremely portable and don’t require you to lift your bike up too high for mounting. Take advantage of the hitch mount at the rear of your vehicle and consider the possibility of a hitch rack for your bikes. Some of these racks are surprisingly costly and they will block off trunk access. Your view can be obscured when using this type of rack so check carefully before committing to purchase. If you drive a truck and you want a specialized rack system, you can effectively turn the bed of your vehicle into a home for your bikes with a truck rack. The downside of this method is that you’ll have no space left on the truck bed for anything else aside from your bikes. If your SUV packs a spare tire on the back door, you can look at a bike rack that attaches to this. You’ll need to remove the tire cover and you’ll be limited to carrying 2 bikes if you adopt this approach. Hopefully, you’ve got some handy hints about getting the most effective rooftop bike rack for your rides away from home. Once you’ve decided that a rooftop bike rack makes most sense for you, choose any of the above models and you and your bikes will be in safe hands. Come back soon for more car-related advice and impartial reviews to make your life easier. Car Accessories And The Law – Are Your Mods Legal?